This is Maya (illusion), a place where you can discover yourself. Located in the picturesque village Aymanam (Ayemenem) - land of five forests - which is also formed the backdrop for Arundhati Roy's Booker prize winning novel `The God of Small Things'. 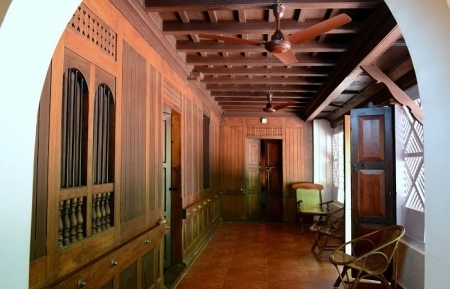 This 100 year old home-stay is situated ad-mist the dense green canopy of mangosteen, nutmeg, jack-fruit, vanilla and rambuttan trees. The air itself is full of promise, fragrant with the myriad scents of fruit and flowering trees. All round is peace and stillness. A river flows slowly past, snatches of sunlight shimmer off the water. This is Maya, a heaven away from clocks and calendar, a place where time is in no hurry. Maya Maya Heritage is located in Aymanam (Ayemenem) VILLAGE ( in Kerala State in India), which is just under 4 Km from the heart of Kottayam town, which forms the hub for accessing all popular tourist destinations of Kerala such as Kumarakom (14 Km), Alleppey (42 Km), Thekkady (110 Km), Munnar (150 Km) and Kovalam (115 Km). 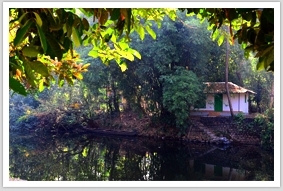 The village Aymanam borders Lake Vembanad on the west, near Kumarakom. There are backwaters, beaches, hills and game sanctuaries withing driving distance from the Maya Heritage - places to suit every mood and inclination for active tourists.